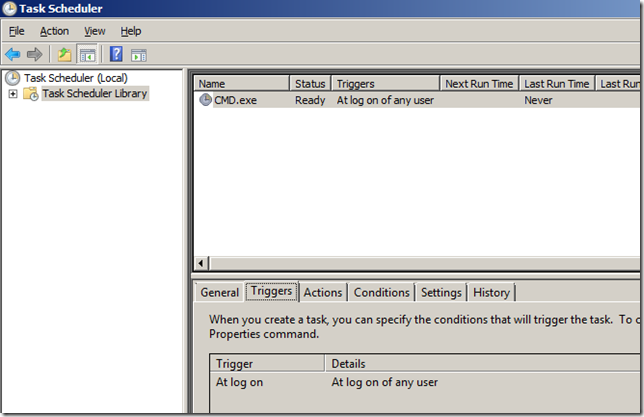 Logon Scripts!!! 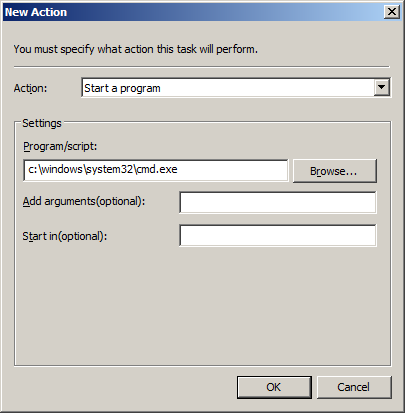 I hear you yelling at me about why I am doing a tutorial about logon scripts when Group Policy Preferences is supposed to allow me to stop using my logon scripts. Well in a utopian world there would be no logon scripts to maintain however there are still some situations that you might have to execute a program at logon. 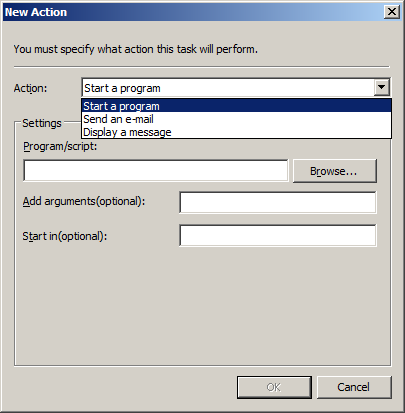 One example I recently saw on the Group Policy Forums was a person who wanted a way to delay the launching of the browser so as to not add additional delay to the users logon to what was already a slow computer. 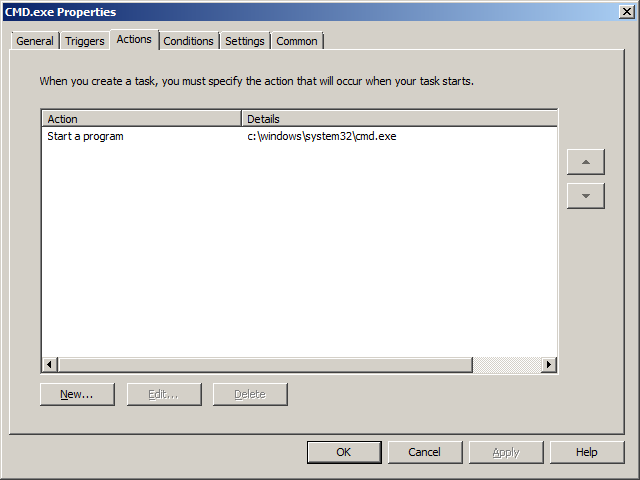 Somewhat similar to the Delay Start option for services that was introduced in Windows 7. Step 1. 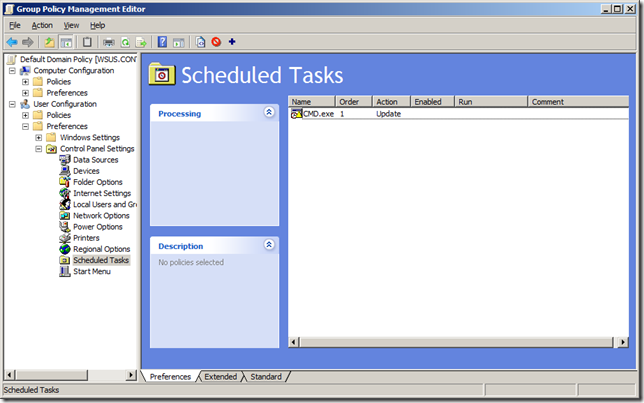 In a Group Policy Object (GPO) that you have targeted at all the users (or most of them) that you want the delayed start program/action to run on go to “Users Configuration” > “Preferences” > “Scheduled Task” then go “Action” > “New” > “Scheduled Task (Windows Vista and later)”. Then type the display name of the script in the “Name” field (see image 1) and click on the “Triggers” tab. 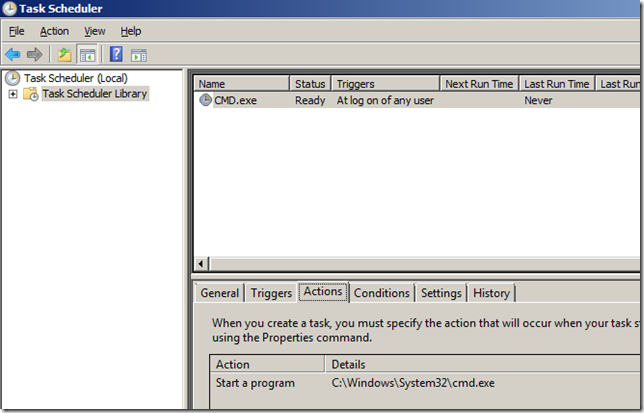 Note: In this example we are just going to be running a command prompt so the Name is “CMD.exe”. Note: Unfortunately this option does not seem to be user configurable so for the use of a logon script “30 seconds” and “1 minute” are the only practical options. Step 3. You should now have the trigger configured for your event that looks like the image below (see image 3). Now click on the “Actions” tab. Step 3. In the “Actions” tab click on the “New” button and then configure the action you want to take. 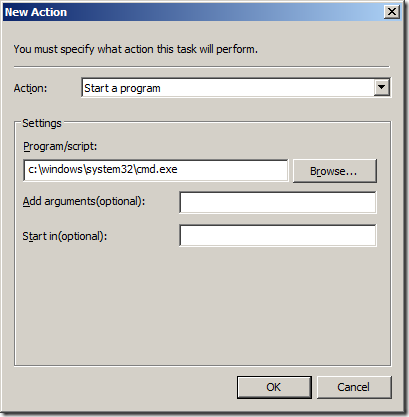 Again in this example we are just going to be running a command prompt so configure the “Action” to “Start a program” (see image 4). 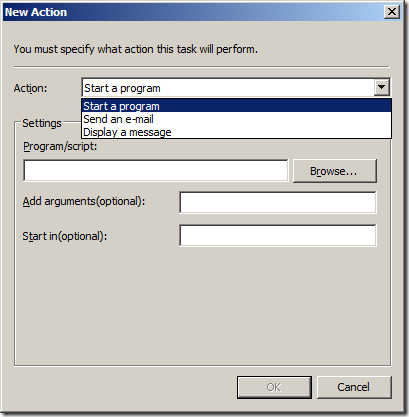 Note: You can also use this option to send and e-mail or even display a pop-up message to the users. Very handy if you used to use the “net send” program in Windows XP before Service Pack 2 as it was disabled due to security issues. Step 4. 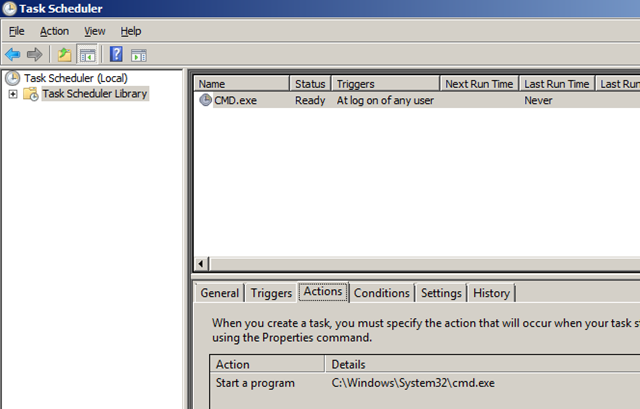 Configure the “Program/Script” to run to “C:\Windows\system32\cmd.exe” then click “OK” (see image 5). Now you are done. 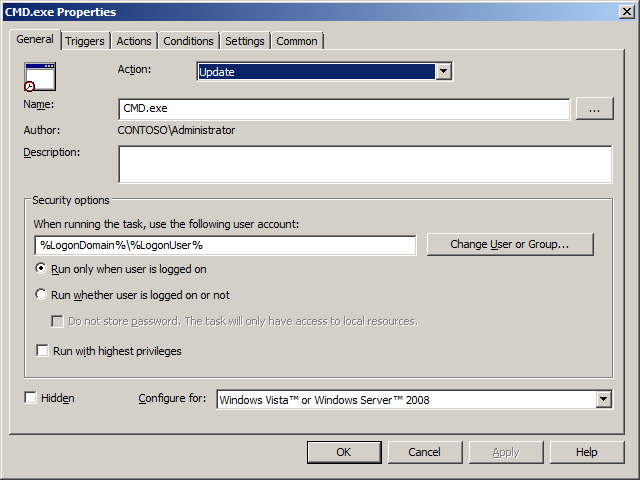 The task is scheduled and it will be pushed out to all your users at the new Group Policy refresh. (see image 7). Note: If you don’t want this to apply to all your user accounts you can also use Group Policy Preferences targeting options to refine the targeting. 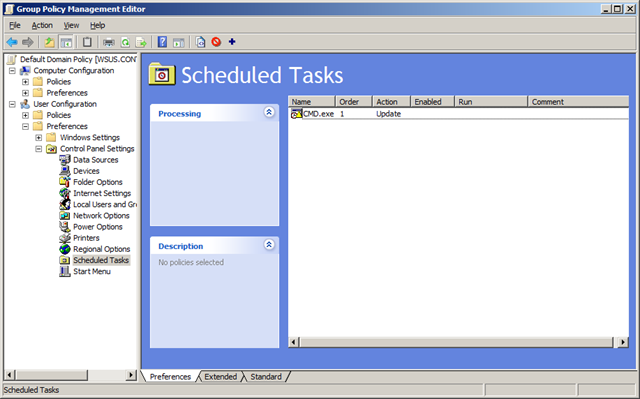 Below is the view of the scheduled task as configured on the computer (see image 8,9 & 10). 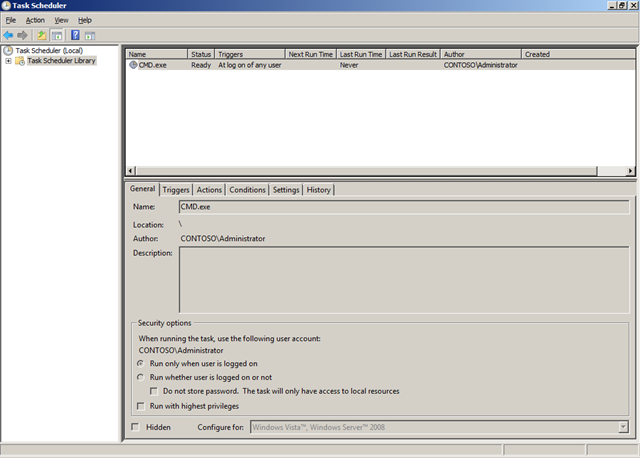 Note: The settings tab are greyed out because it is being controlled by Group Policy. 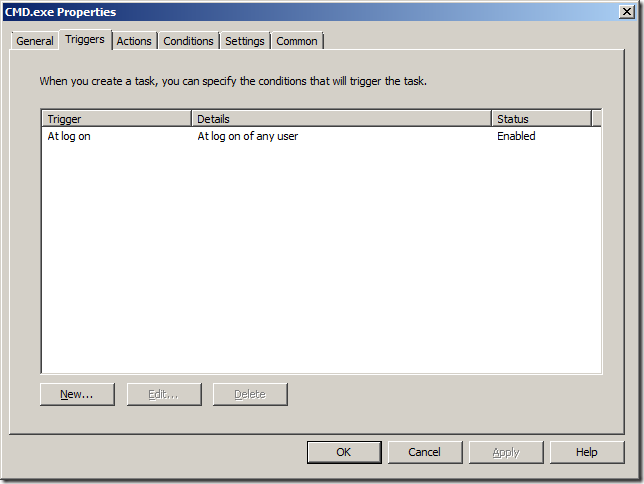 RT @jariangibson: RT @xenappblog: RT @tweetmeme How to schedule a delayed start logon script with Group Policy http://bit.ly/4ujv6R <- Thx! 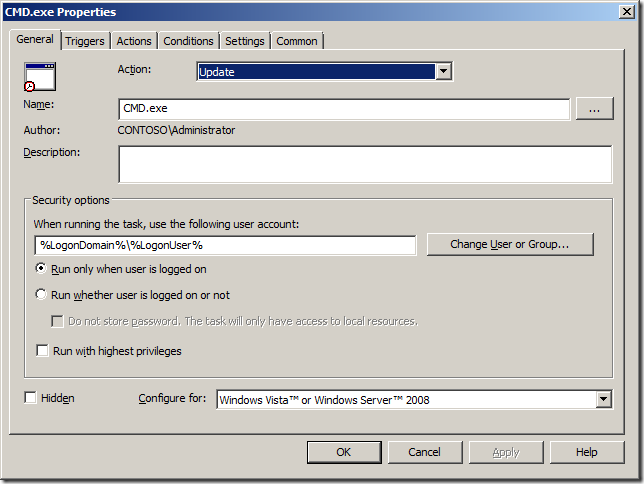 I am logged on as an Enterprise admin on the domain controller. @Zoe Yes this is correct. 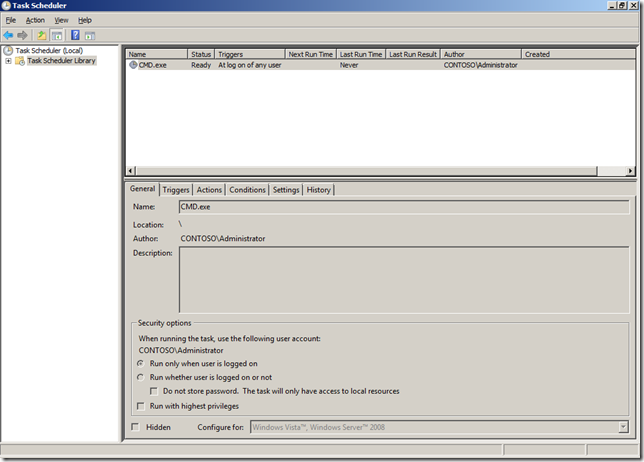 You can only edit Group Policy Preferences from a Windows Vista / 7 / 2008 / 2008 R2 computers… however you can still apply preferences settings to a Windows XP / 2003 / 2003 R2 computers…. 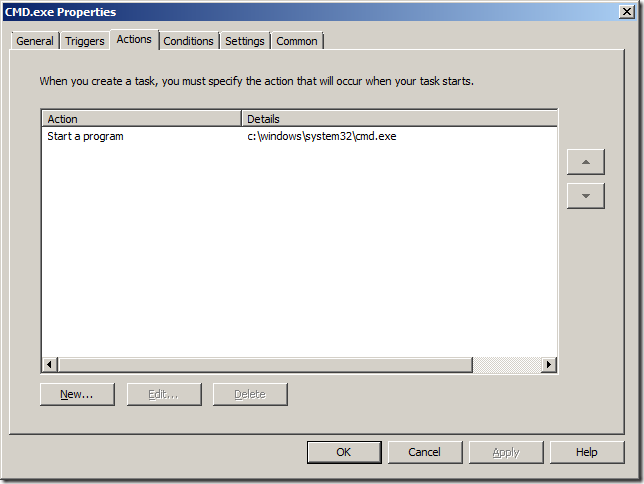 How can I delete a task from all clients using gpo? When I create a task like you do but choose to be a delete action, not update, I have no place to specify which task to be deleted. Is there any step by step tutorial to do this?